I don’t know what Rikku is holding or what that blob is near her head. I’m going to say she’s holding a bag of live goldfish and is eating cotton candy. I love her polka dot PJs. I would love to have Paine’s cute blue and pink short kimono robe, but the fascinator thing she has makes things a little strange. I don’t really have anything negative to say about Yuna, other than I still hate her rattail. I’m glad the girls had time to throw a pajama party. 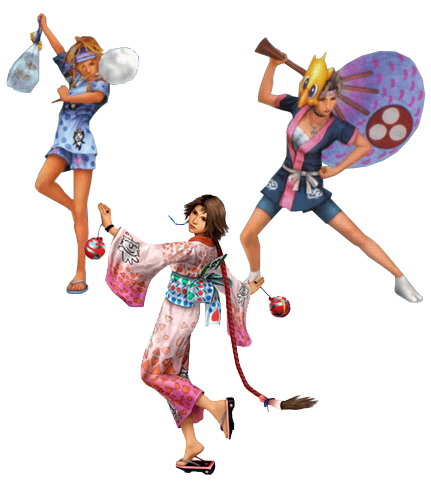 Yuna’s rocking the traditional look and I love her explosive polka-dotted sash and overly-happy moogle sleeves. Rikku is all about comfort here, but her t-shirt has a nice asymmetrical angel cat detail that pops. Paine is combining tradition and comfort, but the chocobo mask and parasol are a bit overkill, and her cameltoe toes are distracting. Masks don’t work that way, Paine. This is not the ’90s and you are not a rapper. I like both Rikku and Yuna’s outfits. I’m pretty sure that they’re yukatas and not pajamas. Yuna’s gets a slight edge because I like the long sleeves and pattern a bit more. The moogle pictures could be cuter though. This entry was posted in Video Games, Who Wore It Best? and tagged Final Fantasy, Final Fantasy X-2. Bookmark the permalink. Paine…..that isn’t how you do that, go sit over there with the fishing stall.